The Institute of Information Technology of the Azerbaijan National Academy of Sciences (ANAS) has put forward an initiative to increase the number of articles in Wikipedia, a free online encyclopedia. The Institute said that work in this area is envisaged in the ANAS action plan for 2013. Currently, more than 37.6 million articles are available in Wikipedia. Azerbaijan's efforts to increase coverage in the online encyclopedia will promote the country internationally. Currently, Azerbaijan with 94,635 articles is in the 47th place among 286 countries represented in Wikipedia. Georgia and Armenia, the other two South Caucasus republics, are ranked 52nd and 68th, respectively. According to the ANAS Institute, over the last eight years, the number of articles in the Azerbaijani language posted in Wikipedia has significantly increased. Whereas in 2004 the number of such registered articles was only 25, the figure has now exceeded 94,000, and it can be increased further. "More attention should be paid to this issue -- presenting to the world historical, geographical, linguistic and other articles," the Institute said. Azerbaijani Wikipedia was launched in January 2002, and the first article in Azerbaijani appeared in April 2004. As of May 16 it has 58,026 registered users, including 14 administrators. 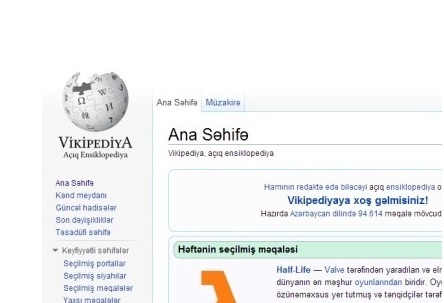 Azerbaijani Wikipedia has been consistently increasing the number of its articles. However, some of the articles are in the form of stubs or have grammatical and syntactical mistakes. The first meeting of the Azerbaijani Wikipedia Community was held in Baku in December 2009. The event was organized in order to forge ties of friendship and familiarity between Wikipedians and mull a number of issues including technical problems and prospects for future development. Wikipedia is a multilingual, Web-based, free-content encyclopedia project operated by the Wikimedia Foundation and based on an openly editable model. It is written collaboratively by largely anonymous Internet volunteers who write without pay. Anyone with Internet access can write and make changes to Wikipedia articles, except in limited cases where editing is restricted to prevent disruption or vandalism. Wikipedia's articles provide links to guide the user to related pages with additional information.